Three ring burner keeps your large stock pots plenty hot. 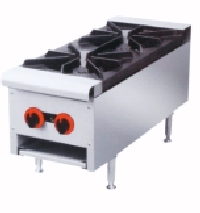 This stove is good for small restaurants, cafes, food trucks and snack bars. 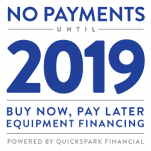 Dimensions: 22(W)" x 18 (H)" x 22.2(D)"
You can save on shipping charges if you have your equipment sent to a business that has a forklift or loading dock! Please check box if you do not have a business address or loading dock or forklift. Check non-commercial delivery box if your delivery location falls into any of these categories. Durable stainless steel structure, corrosion resistant and easy to clean. Simple and reasonable structure , easy to manipulate and maintain. Investment casting burners with stable fire and standby pilot. Heavy duty iron-casted grate and strong bearing performance. Independent manual control to save energy. Adjustable stainless steel stand. This stove is good for small restaurants, cafes, food trucks and snack bars. Dimensions: 12(W)" x 30 (D)" x 14.2(H)"
A bain marie is a utensil and a cooking technique. One container with food to be cooked is placed in another, larger pan containing water that is at the simmering point. This method of cooking surrounds the food with very gentle heat and is used for cooking delicate dishes like custards or white sauces, or melting chocolates. Perfect for your restaurant, bakery or pastry shop. Dimensions: 31(W)" x 14 (H)" x 33.3 (D)"
Gas restaurant medium-duty range, 24" wide with space saver oven accepting 18" x 26" sheet pans depth wise. Oven is heated by a heavy duty straight tube burner (27,000 BTU). Range has (4) cast iron lift off burners rated at 30,000 BTU’s. Individual top grates for each burner. Porcelain oven interior with removable bottom oven pan. Thermostat is adjustable from 150° F to 500° F. Spill-proof pilot ignition system. Includes one chrome plated oven rack, 6" adjustable legs. Overall Dimensions: 24" W x 33.12" D x 57.5" H.
Please specify Natural or Propane Gas in the options below. 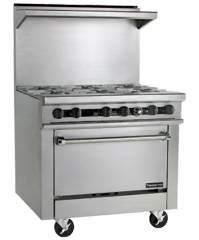 36" gas restaurant range with full size oven accepts 18" x 26" sheet pans in either direction. Range oven bottom is heated by heavy duty steel straight burner. Open burner top sections available with 6 burners and are heated by individual lift-off cast iron open top burners with individual top grates. Oven interior door and bottom porcelain. Sides, back and top aluminized. High temperature fiberglass knobs, cool to the touch. Fully stainless steel exterior. 6" adjustable legs. Gas pressure regulator (specify Natural Gas or LP). Heavy gauge welded frame construction. Oven interior door and bottom porcelain. sides, back and top aluminized. Standard oven interior dimensions is 26 1/4" wide, 27" deep, 14 5/16" high. One chrome plated oven rack per oven. Removable oven bottom for easy cleaning. Ribbed oven door for added strength and seal. Thermostat is adjustable from 150°F to 500°F. Heavy duty steel straight burner at 35,000 BTU/hr. Cast-iron lift off two piece burners rated at 30,000 BTU/hr each. Spill-proof pilot ignition system reduces pilot outages and hazards associated with exposed pilots. Individual cast-iron top grate every 12" x 12" section. Burner supports located every 12 inches to increase overall top strength and structural integrity. Controlled by a single-piece precision brass valve with infinite adjustment. Oven interior dimensions 26 1/4" wide, 27" deep, 14 5/16" high. (casters optional ) Griddle Range 36" 4 Burner-12"
Gas medium duty range 36" wide with full size oven accepting 18" x 26" sheet pans in either direction. Oven is heated by a heavy duty straight tube burner. Lift off cast iron open top burners. Individual top grates for each burner. Available 5/8 inch thick griddle plate. Valve controlled or thermostatically controlled. Griddles are heated by a heavy duty "H" burner. Available with hot tops in 12" sections. Hot tops are heated by heavy duty "H" burners. Aluminized oven interior. Porcelain inner door panel and removable oven bottom. Fully stainless steel exterior. Single deck high shelf is standard 5/8" thick polished steel plate. 21 1/2" working depth. Spatula width grease trough. One heavy duty "H" burner per 12" section @ 20,000 BTU’s . Each 12" section is controlled by a valve or a thermostat. Manual control is standard. Thermostat control is optional. Large capacity grease container with integral lid. Available 5/8 inch thick griddle plate. (casters optional ) Griddle/Oven 36" 2 Burner-24"
This gas range sits on six inch adjustable legs. It runs on either propane or natural gas and features one oven, two open top burners, and a 24 inch griddle. This range comes with a 3/4 inch NPT gas connection and a gas pressure regulator at no extra charge. It is backed by a one year limited warranty, is UL approved, and is rated at 135,000 BTUs per hour. The exterior is fully stainless steel, and that includes the single deck high shelf. The oven has a heavy-gauge welded frame and is 26 ¼ inches wide, 27 inches deep, and 14 5/6 inches high. It has an interior that is fully porcelain, which holds removable chrome plated oven rack sides, a removable bottom, and and one chrome plated oven rack. There is a ribbed oven door on this gas kitchen range, a push button igniter for the pilot, and a thermostat that is adjustable from 150ºF to 500ºF. Inside of this oven is a cast iron "H" burner that is rated at 40,000 BTUs per hour. Both of the open top burners in this gas range are made of cast-iron, can be lifted off, and are rated at 30,000 BTUs per hour. These burners feature a spill-proof pilot ignition system and each burner is covered by a durable cast-iron top grate. The burners are each controlled by an infinite adjustment brass valve. To the left of these two burners, this kitchen range features a 24" griddle that is ¾ inch thick polished steel. 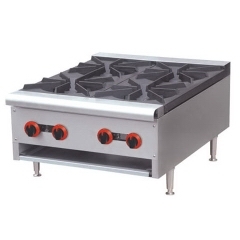 There are two heavy-duty, cast iron, "H" burners in this griddle, and each burner is rated at 20,000 BTUs per hour and has its own manual control valve or thermostat. 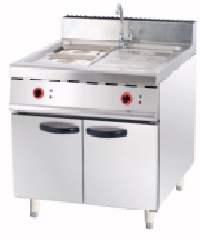 The griddle on this commercial range utilizes a spatula wide grease trough and a large capacity grease can with an integral lid. This commercial gas range requires a 12" side and 6" back clearance from combustible materials. Optional features are available including an extra oven rack, a thicker griddle plate, or 6 inch swivel casters. 24" griddle 3/4" polished steel. Oven interior dimensions 26 ¼ inches wide, 27 inches deep, and 14 5/6 inches high. Dimensions: 57-1/2'' H x 36'' W x 33-1/2'' D.